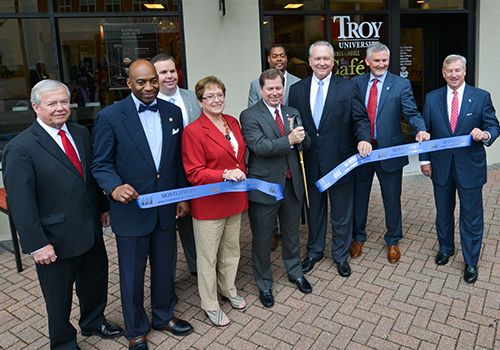 The new Trojan Café, located in downtown Montgomery, officially opened with a ribbon-cutting ceremony attended by Troy University, Barnes & Noble College and City of Montgomery representatives. 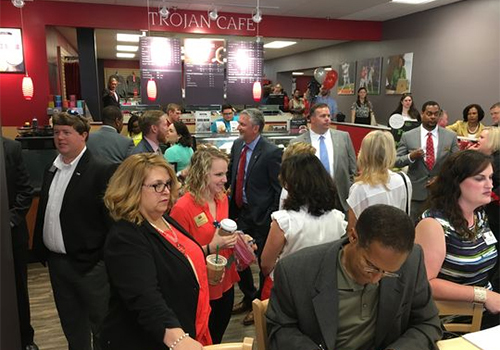 The new café is part of Troy University’s Montgomery Campus. Located across the street from the Rosa Parks Library and Museum, the café utilizes interior graphics and photos to highlight Troy University and pay homage to Rosa Parks, “Mother of the Civil Rights Movement.” The cafe offers a variety of Starbucks™ beverages and an assortment of sandwiches, soups, pastries and snacks to students, faculty and staff, as well as the local downtown community and visitors to the museum. The 25-seat cafe also provides window seating with charging stations, as well as a large ‘community table’ that serves as a convenient meeting place for local organizations and groups. In addition, the new cafe will also be the official dining option for Troy Montgomery students.